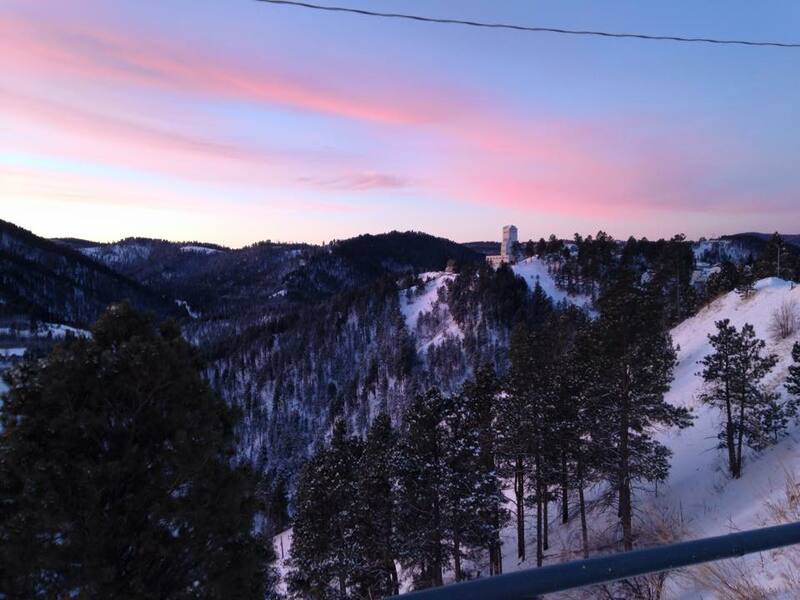 The Black Hills of South Dakota may seem an unlikely location to hunt for dark matter, even if the name does seem fitting. If they are known for one thing, it’s gold – and gold requires a mine. Gold mining means deep underground caverns, which just happen to be the perfect home for low background experiments such as dark matter searches thanks to the cosmic ray shielding properties of thousands of feet of rock. I am currently in Lead, S.D. working underground on LUX, the Large Underground Xenon detector. 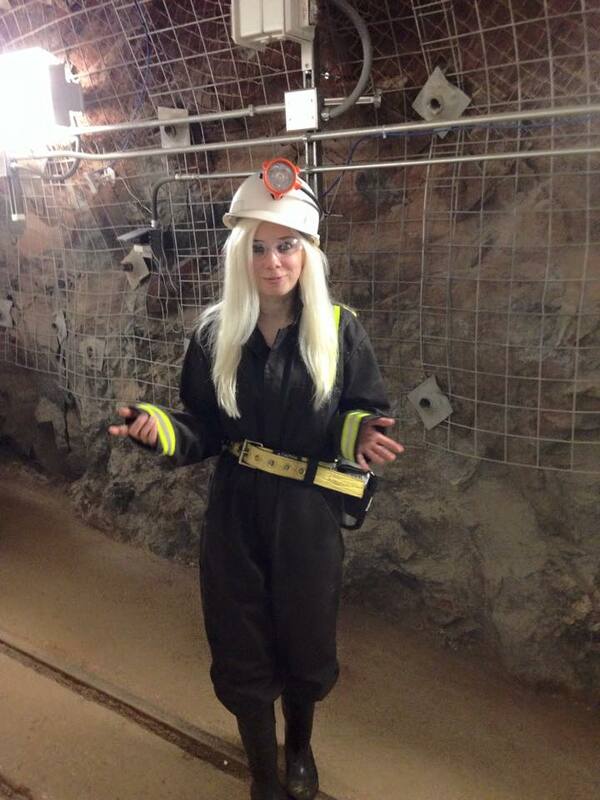 LUX sits in the Davis campus of SURF – the Sanford Underground Research Facility, an underground lab built in the Homestake gold mine. The Davis campus is named after Ray Davis, whose famous Homestake neutrino experiment was the first to detect neutrinos from the sun. LUX now sits in the same cavern that once housed his ground-breaking experiment. 5.15am – I wake up. Getting up this early is a little unnecessary, but I like to have some time to wake up in the morning! I have a chat with my boyfriend back in London and spend some time reading my emails as I am 7 hours behind the UK over here. 7.00am – We leave to drive up to the mine. Lead is a tiny town and it only takes a few minutes. The streets look like they are straight out of a cowboy film! Beautiful morning view from outside SURF. There are two shafts, we use the Yates. The Ross shaft is visible centre-right. 7.15am – We arrive at SURF. We’re always a bit rushed; we grab our head torches and head to the changing area. Overalls, steel capped dirty boots, helmets, safety glasses, self-rescuers and the head torch all have to be donned. It’s unpleasantly hot, as the water running down the lift shaft must not be allowed to freeze. We take two golden tags with our name on and place one on a board to show we have gone underground, the other stays on your person (to identify your body…? Doesn’t bear thinking about!). 7.30am – The cage (literally a big metal cage that acts as our ride downwards) departs from ground level. The cage operators have impeccable timing and take care of opening and closing the door and contacting the hoist operator, who will lower us down from the surface. Usually the morning cage isn’t too busy (there is an earlier one at 7am) but it’s still not the most pleasant experience. Sometimes we are all a little too close for comfort – miners don’t tend to be small guys! Also, if you stand in the wrong place you get cold water dripping on you for the whole journey. 7.45am – The cage arrives at the 4850 level – 4850 feet underground. We leave the cage and head to the bootwash. LUX and the other main experiment at SURF, Majorana, both need clean conditions as they are low background experiments. Any dirt treaded in to the lab could contain radioactive elements that would be very bad for our detectors. For Majorana, the need for cleanliness is much higher than LUX, and so they have a cleanroom that requires them to wear special body suits, face masks and hair nets. I am extremely glad that isn’t necessary for LUX! After cleaning our boots, we remove all of our gear except for the glasses, change into clean steel-capped boots (I obviously have pink ones!) and new hard hats. 8.00am – Morning meeting. We all gather in the LUX control room and discuss the plan for the day. This can vary wildly depending on the decisions made in the weekly planning meeting. We may have taken data or seen conditions that suggest something needs investigating or fixing, or it might just be boring old WIMP search mode where nothing special needs to be done. The control room is the only place where we can remove our hard hats and safety glasses – stopping people leaving the room without them has to be done regularly! 12.00pm – We tend to take a break for lunch. Throughout the morning, everyone will have been going about their various shifting duties – monitoring all aspects of the detector, sampling xenon to check its purity, injecting krypton for calibration, refilling the liquid nitrogen store etc. We may have received some training from off-site system experts or attended a meeting, depending on what day it is. Conditions underground are pretty good, you start to forget where you are – only the lack of windows and bumpy walls remind you! During my previous visit 10 months ago we still had incinerator toilets – the less said about these, the better! They often broke down after the lunchtime rush and if you needed the toilet you had to put all your dirty mining gear back on and go to use the chemical toilets out in the mine. Now, thank god, we actually have running water! View from the lower Davis. The water tank containing LUX is visible in the centre. 4.00pm –If we are lucky, we get the cage up at 4. If something has gone wrong or there is enough to be done we may have to stay till the next cage at 4.45pm or even the latest at 5.30pm. In an emergency we may be able to come up later but we prefer to not have to do that! So it’s back to being squished in a damp dark cage full of South Dakotan miners! 6.00pm – dinnertime! Often someone will cook a group meal or we will head out to get food either in Lead, Deadwood or Spearfish. If it’s Friday, we go to Lewie’s for greasy burgers to do the “pub quiz” (I have been attempting to teach my American colleagues some proper English) . We tend to do very well in the trivia sections of the quiz, but the music round is our weakness. There’s too much country for us outsiders. The quiz host pulls several names out of a hat for prizes each week; so far on this trip I’ve won an extra large bud-light t-shirt (bear in mind I wear XS…) and some hot wings, which as a vegetarian I couldn’t eat! 8.00pm – depending on the person / how much work they have to do, some of us may continue to work. I mainly do analysis work and sometimes find I don’t have much time to get it done during the underground day so sometimes I try to get a bit done at night. I am also currently the shift manager so I have to fill in a shift report detailing what we have done each day. 10.00pm – bedtime. I’m wiped out by this stage and fall straight asleep, usually dreaming about LUX. But it’s not all hard work. Every other weekend we get 4 non-underground days, which gives us a little time to see the sights of South Dakota (or, if gambling is your thing, there are plenty of casinos in Deadwood)! On my last visit, I visited Mount Rushmore (smaller than you’d think) and Crazy Horse (much bigger than you’d think! ), the latter being an enormous mountain carving that has been in progress for over 50 years – still, only his face is complete. If we go somewhere far, someone always has to stay close to SURF in case of an emergency – our detector might need us! 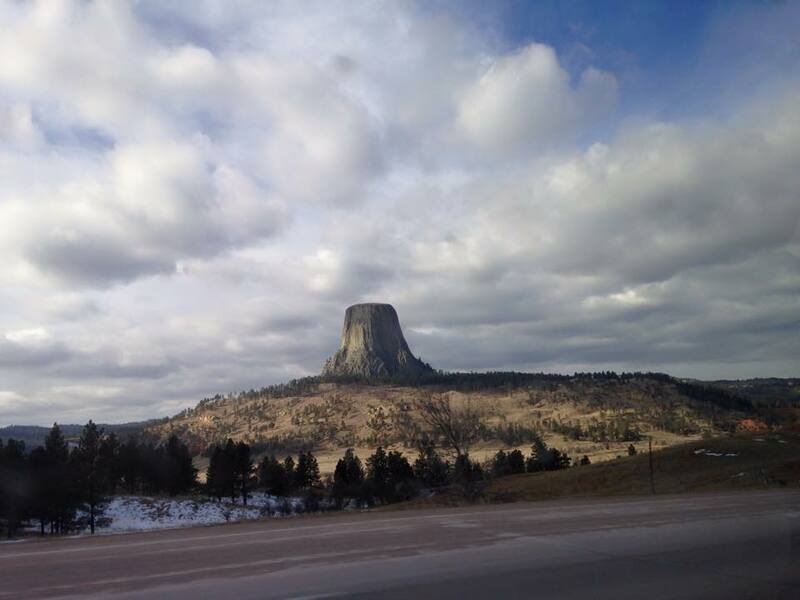 This weekend we headed over to the neighbouring state of Wyoming to see Devil’s Tower; an ethereal protrusion of volcanic rock 1,267 feet above the surrounding ground! It was an incredible sight, although temperatures had dropped and I spent most of the time there jumping around trying to restore circulation to my hands. I have Raynaud’s syndrome, which means the moment I get slightly cold my fingers turn white and become extremely painful! We actually had -19 C (-2F) here in Lead a couple of days ago – not fun! Luckily, it’s warm underground! Speaking of the weather, this time of year there’s snow, so much snow! It’s crazy to think how Britain comes to a standstill with schools and businesses closing when we get a tiny smearing of snow, whilst here several feet overnight is not uncommon. But life goes on in Lead, and we usually still make it up the hill to the mine! Lead is a place very different to London – everyone is so friendly and pleasant! There’s no avoiding all human interaction like on the tube in London – everyone says hello! It is difficult eating as a vegetarian here, but most places have been accommodating and have allowed me to order special things (e.g. a salmon salad with no salmon, a Reuben with no beef!). The locals are always interested to hear how things are going at SURF. Amusingly, one resident excitedly asked “You’re from Pizza Lab?” after they heard us discussing the lab! One big shock to me, however, was finding out about the gun laws here in S.D. – concealed carry permits can be issued and apparently most people you see will be carrying a gun (maybe an exaggeration? But maybe not, you just can’t tell!). But then again all the gun laws in America seem alien to us Brits! The staff at SURF are also extremely accommodating, helping us get underground in emergencies, and their health and safety policies are commendable. Right now, most shifters are getting trained as “guides” – each research team has a guide who is responsible for getting you to safety, whether that is above ground or in the refuge chamber. The refuge chamber is something we all hope to never have to use. In the event that we cannot reach the ground from either of the two mine shafts, and that the rest of the mine is dangerous to inhabit (for example a fire causing a lack of oxygen), this is where we would go. It has carbon dioxide scrubbers, oxygen, water and a huge supply of “nutrition bars’ – rock hard bars containing a whopping 500 calories each so that someone could easily survive on two to four a day. There is enough oxygen for the entire underground population to survive for many days, awaiting rescue – but it’s not something we like to think about happening – especially since the toilets are just buckets! As much as I prefer to be safely in front of my laptop, with no million dollar detectors in my hands and not facing the risks of working underground (note to self, do NOT go back on the Wikipedia list of mining accidents! ), I do enjoy being on-site. It makes me feel like I’m actually part of something. We are the “underground crew”, a team of physicists travelling 4850 feet below Earth’s surface every day to take care of our precious detector. 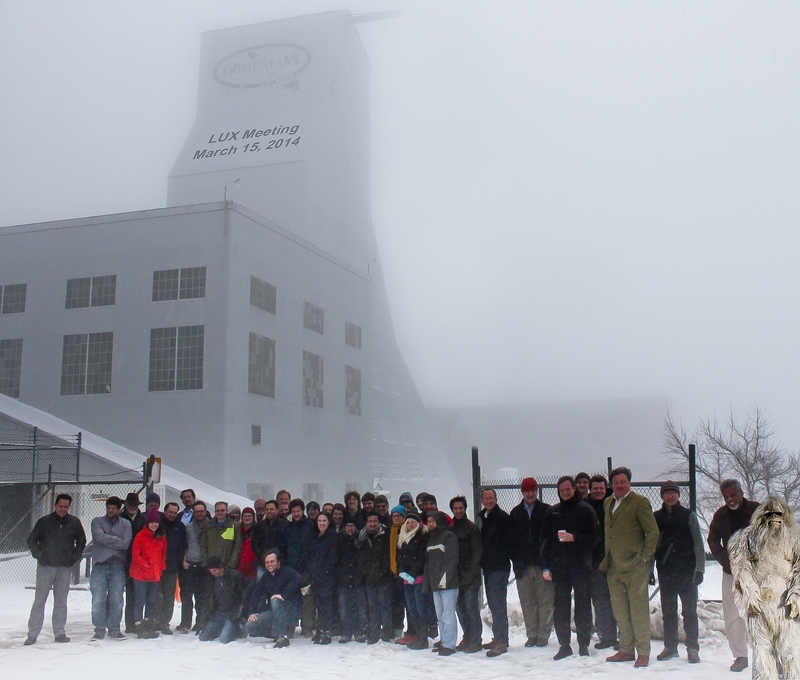 We keep things running smoothly, allowing LUX and our colleagues off-site to keep on searching for dark matter! Who knows, the Black Hills may yet bear some dark matter fruit!